Werner's Cairns blog: What else is in the fluoride package from China? What else is in the fluoride package from China? More and more people are starting to ask questions in regard to what else is in the fluoride bag that comes from China, that Anna Bligh and her cohorts have mandated to be put into our drinking water - which we have to drink whether we l ike it or not. There were two letters to the editor in our local daily, the Cairns Post, expressing concerns about the fluoride from China, which I will publish below for those who don’t read the Cairns Post. Click on picture to enlarge. If our four Labor MPs would be worth their salt they would immediately take action and request that these fluoride bags be analysed to find out what else we are drinking with our water. But they are sitting on their hands and doing nothing; and the opposition is not any better. Democracy has gone out of the window in Queensland. Here we have the ALP’s idea of government in action: “We do as we like, we are the government!" Two interesting links that may take the blinkers off some misinformed people. “60 Minutes” on pesticides recently. Click here. Water Supply at mercy of China. Letter 1. WHEN fluoridation was legislated, the then Queensland health minister assured us it was coming from Belgium. The water authorities make their own decisions on that, however, and almost all have decided to buy from China because it is easily available and cheaper. This product is not tested before it is dumped into our drinking water. It comes with a batch analysis which gives the percentage of fluoride, and little other information. How do we know what else is in it? What else could be put in it? We have no idea. Why is this travesty allowed to continue? - Margaret Phillips, Bayview Heights. No confidence in Chinese fluoride. AFTER reading the letter (12-4-10) about Chinese fluoride in our water supply, I felt it imperative to add to those valid concerns. The US is also importing cheap water fluoridation chemicals from China and a recent evaluation found that much of the fluoride used for water fluoridation now coming out of China exhibit arsenic and lead levels of 50mg and 40mg respectively a bag. Sourcing anything to add to our drinking water from a country with a track record of lead paint on toys, anti-freeze in cough syrup, 400-times the acceptable concentrations of formaldehyde on children's clothing and toxic chemicals in baby formula and milk is unacceptable. The saying "good isn't cheap and cheap isn't good" applies here or if readers are familiar with the Georgia Guidestones, maybe not. We can no longer trust our governments to do the right thing for their citizens. Eric Hallforde, Atherton. By the way, here is a letter from the North Queensland Party and it is worth keeping this in your mind for the next state election. Click on picture to enlarge. Thanks for your query on NQP's position on compulsory fluoridation - as we noted in a reply to your earlier query late last year on our web-site, NQP strongly supports a Community Referendum on the question - and our party will be calling for such a Referendum soon. citizens should be given CHOICE on such issues. "Paranoid" is someone who notices things without government permission. A "conspiracy theorist" is anyone who draws unacceptable anti-government conclusions from politically inconvenient facts. What, fluoride from China? Thank you, Werner, for publishing this on your blog; we don’t get the Cairns Post very often. Our family is totally opposed to fluoride in our drinking water, however, since we have no choice but to drink it, we too would like to know what else is in the fluoride bag besides fluoride. We ask the same question as Margaret Phillip, namely: ”Can anyone see a problem in allowing any foreign country direct and uncontrolled access to the water supplies for the entire country?" Yes, we can see a problem, especially when this poison comes from a totalitarian country where they still use pesticides other countries have banned. We also agree with your sentiments expressed in your mountain stream picture. By the way, our four kids, all grown up in Cairns and beyond their thirties have all healthy teeth. 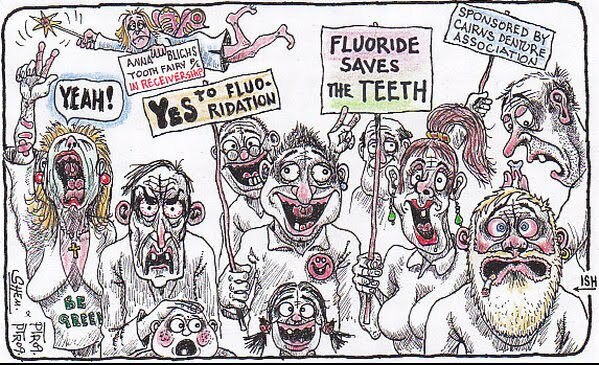 God help us, cheap fluoride from China and we are forced to drink it; I bet Bligh and her cohorts don’t. Eric Hallforde, from Atherton put it in a nutshell. 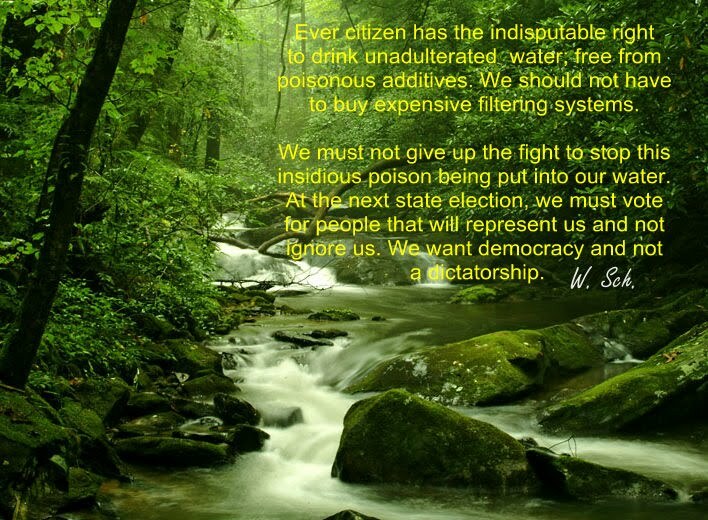 “We can no longer trust our governments to do the right thing for their citizens.” And so say all of us. Are Indians safer in India than Australia? What you didn’t have a laugh today? Are we caught between a rock and a hard place?